The Holy Fire spreads to nearly 10,000 acres as mandatory evacuations go into effect. As of today, evacuation shelter population has drawn down, and food service is expected to end after today. The shelters themselves are expected to close within the next day. Although the need for shelter support is drawing down, there are people that will need continued support in order to rebuild after the fire. Financial donations enable The Salvation Army to meet these diverse needs immediately. To support, click here or call 1-800-SAL-ARMY. With a massive overnight increase, the Holy Fire grew to a size of 9,600 acres, initiating a series of mandatory evacuations across Orange County and Riverside County. Originally beginning on Monday, August 6, the fire currently sits at 5% containment and has destroyed 12 structures. 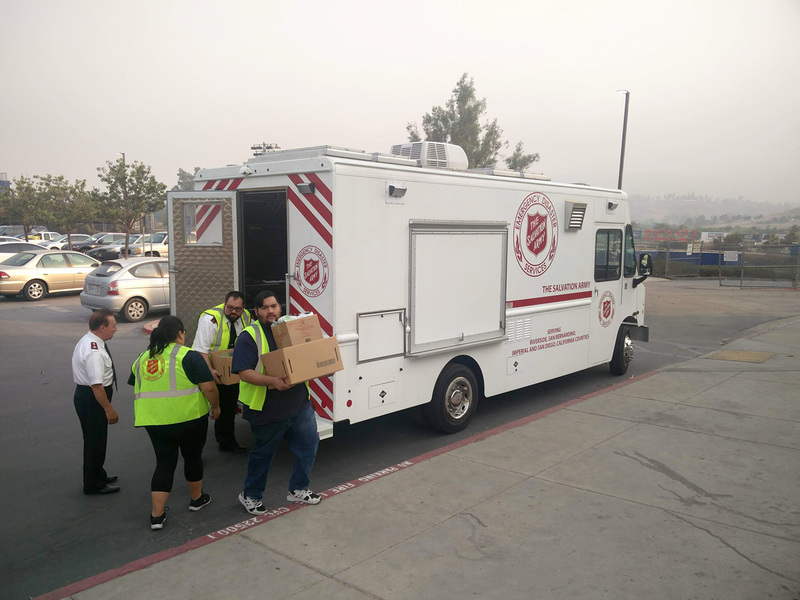 The Salvation Army has been asked to help with food service at two evacuation shelters: San Juan Hills High School (29211 Stallion Ridge, San Juan Capo, CA 92675) and Temescal Canyon High School (28755 El Toro Rd, Lake Elsinore, CA 92532). The food service will begin on Friday, August 10, and will be managed by The Salvation Army Tustin Ranch Corps and Murrieta Corps, respectively. As the situation evolves and service begins, we will continuously update this page. Donations allow The Salvation Army to provide rapid response based on immediate needs, as well as plan for long term recovery assistance. To donate, click here or call 1-800-SAL-ARMY. For more than 130 years, The Salvation Army California South Division has provided services and hope to those in need from San Luis Obispo to San Diego County. The Salvation Army's history of public service dates back to 1865, over the years it has since evolved into a social service provider of unmatched scope and breadth - delivering assistance to those in need without discrimination. Internationally, it is an organization with a lineage of public service that dates back to 1865, and has evolved over the decades into a social service provider with an unmatched scope and breadth. The Salvation Army currently has representation in more than 128 countries worldwide, in addition to nearly 8,000 centers of operation across the United States.